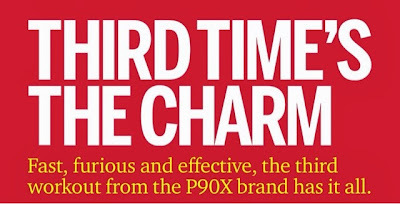 Joy in the Journey: P90X3 - Good Enough for Oxygen Magazine, Good Enough for Me! 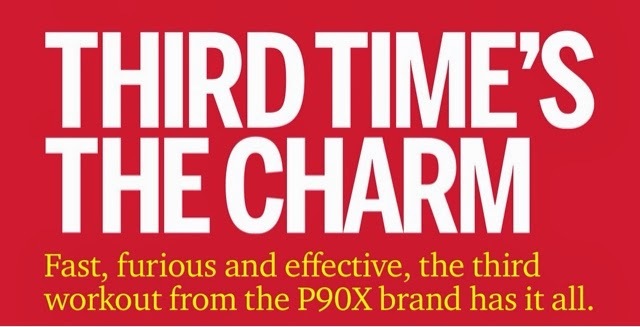 P90X3 - Good Enough for Oxygen Magazine, Good Enough for Me! Beachbody has done something incredible in the last few months. They have taken two of the best-selling and most transformative workouts and - in a sense - condensed them into programs that take 30 minutes a day OR LESS! Of course, I am talking about Focus T25 with Shaun T and P90X3 with Tony Horton. These programs are short, but intense. They promise results, and they deliver. 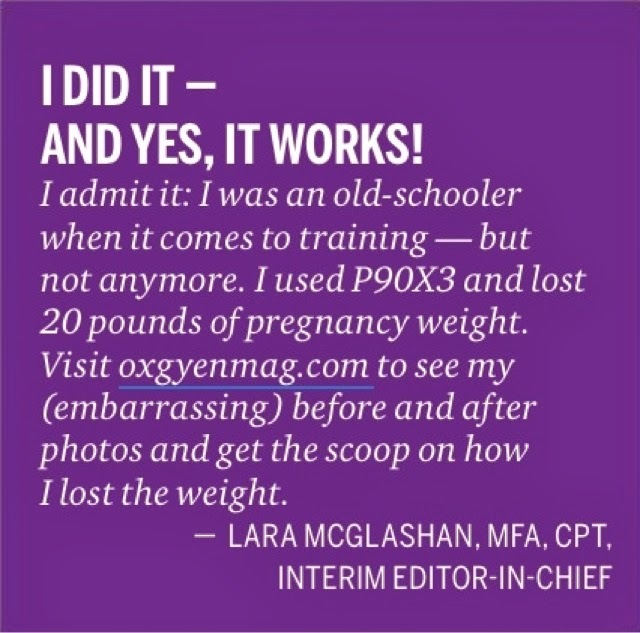 Just take it from Lara McGlashan, the interim Editor-in-Chief of Oxygen Magazine. 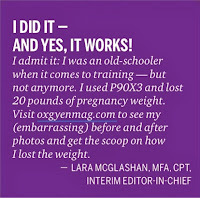 She wrote an article in the January issue of Oxygen telling her story and her experience with P90X3. The title? I think that pretty much means she liked it, don't you? The article then directs the reader to an article online to see the author's results and her opinions on the program. 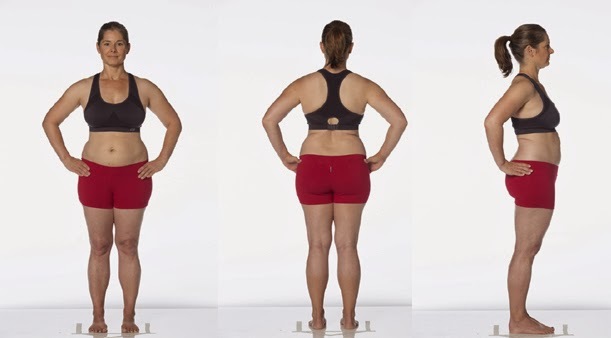 This previously fit woman lost 20 pounds of baby weight, including 8 pounds off of her pre-pregnancy weight! "As a former fitness competitor and general workout freak, I was mortified to have lost my shape so resoundingly. But after a high-risk pregnancy and a divorce shortly thereafter, I was suddenly a single, working mom with a tiny baby and no time whatsoever to exercise. Sounds like a cop-out, right? I used to think so, too. Back when I was a personal trainer, I used to give my new mommies crap all the time about skipping exercise, insisting they could absolutely find the time to do it if they tried hard enough. Yeah, I ate my words a hundred times over in 2013. Fortunately, during my 15-plus years in this nutty fitness business, I have met some incredible people, so when seven months after having my baby I was still schlepping around 20 extra pounds, I reached out to some of my most excellent friends to help me get back into shape. I heard that the Beachbody crew were testing a new workout program and were looking for guinea pigs. Uh, hello! Pick me! They were kind enough to allow me to participate from home using their demo DVDs and do their super-secret P90X3 workout, which was still in development. What hooked me on this program? 1) It’s Beachbody. They’re awesome no matter what workout they were going to give me. 2) The program was only 30 minutes. Surely I could find 30 short minutes in my day to exercise, right? So I vowed to do so and started my workouts immediately. I was never really a train-at-home kind of girl, preferring to hike, mountain bike, ski, snowboard, play beach volleyball and generally do anything active that involved the outdoors. But once I had a little dude to take care of, all that stuff had to go on hold and my exercise had to come indoors and get done while he slept. But even though my garage wasn’t as picturesque as a hike in Southern California’s Santa Monica Mountains, the X3 program sounded great, so I decided that for 90 days I could make it work. Now, I have to admit I was a doubter. I am of the old school, used to doing 60-plus minutes of strength training and umpteen hours of cardio to stay lean and fit. 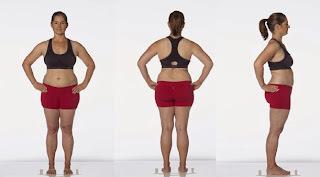 I thought that there was no way I was going to get the results I wanted in only 30 minutes, and I even asked the Beachbody people if they would give me a Spin bike so I could do extra cardio after my 30-minute X3 DVD session. But they sort of chuckled and told me to be patient and left me bikeless. Well thank goodness they did. After my first week of workouts, I was a mess! A sweaty, sore, quaking blob. My muscles were weak, and my cardiovascular system was pathetic. My body jiggled in all the wrong places, but … I loved it! It was awesome to be on the move again, and the program was indeed a challenge. I was never bored, and I loved the variety and the progression of the workouts. Each week was different, and I always looked forward to my next workout. Ultimately, here is how I looked on Day 90 of my program. I lost all my lingering baby weight, a total of 19.8 pounds, and was even 8 pounds lighter than I was when I got pregnant! At 44 years old, that ain’t too shabby. Three months later, I still look and feel great. I have back my confidence, my sense of self and my pants! I can keep up with the all-day demands of an active 1-year-old and still have the energy to get all my work done. This program is amazing, and I would recommend it to anyone of any age and any fitness level. And for you old-school doubters out there — it works. I am a convert. Don’t believe me? Try it for yourself. All you’ve got to lose is some fat! Shall we look at those before and afters again?